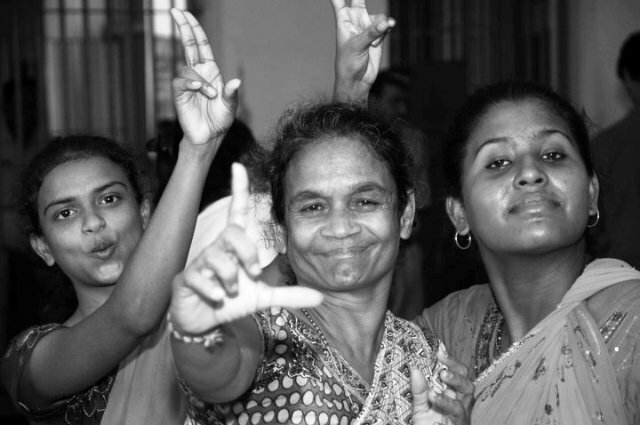 Cornered women in the barricades of the Byculla Jail blooming amid dance and music. Pic: Dhriti. Hope is the word she knows, as she thrives on faith that ‘all is good’. I saw her on a television reality show – Sarkar Ki Duniya – two years back and again with Akshay Kumar on MasterChef. But when I found Sumisha Shankar involved in healing people through art, she was bound to catch my attention this time. Yes, life is about living it. And Sumisha truly lives it. “I left army when I was just feeling good; I was raring to feel better, and to give best to the people,” she told Greater Voice. A singer and a trained dancer, Sumisha feels the spring in her body and steps. But how does she heal? Ah, she went to Mumbai’s Byculla Jail recently to sing-n-dance with its inmates, to make them feel good, to let them feel free inside the women prison, to do hip hop to shaayri. “Suddenly in the eyes of the high security, creativity bloomed,” she recalled. Why not – isn’t that the power of music? How often do you give such healing touches to the suffering souls? How often do you feel the pain of people living in a world of darkness? How often do you try to give someone such little pleasure that lasts long? How often do you use your resources to help people overcome their psychological issues and guilt? Ask yourself, today. On entering the jail, she and her friends working for a non government organisation ‘Dhriti’, were surprised to see the lack of watch towers, shot guns and growling hungry dogs. After the traditional red tape, irritated faces and pat downs, they could finally reach the recreation hall where the jailers tried to look indifferent but couldn’t keep their poker faces on for long. “I had entered with the perception, among many, that these were people without music in their lives. However, after a few inside jokes and snickers, they started singing. The sound was unanimous, harmonious and likable,” she said. Good Sumisha, even for a brief moment you lit some lives, knocking on the heaven’s door. Today, many like you need to sing, dance, play and get faces smiling. People do make many bad judgments in their lives. But there should be people like you to connect with them, too … to change their lives. Making a difference in other’s lives is so worthwhile. In fact, nothing beats that when people like you start doing things for which all other moments can wait. look at the picture and the confidence on their faces………….. This is so informative….. brilliant piece of work . very well written…keep it up neeraj. this write-up as covered in a business online site got over a lakh hits. thanks for the appreciation. Could we try this experiment in Pakistan by our sweet music? What do we do when the sin itself has become bigger and taller than the sinner? In Mahabharata we read the Great Battle Epic with interest. We as Hindus regard Krishna as God and Dronacharya was their pious Guru yet we could not prevent the largest human tragedy in the history. I find it difficult to reconcile with your philosophy. I also often say, “Hate the sin, not the sinner”. But in practice I find it difficult to equate it when we see Osama, Gaddafi, Al-Awalaki etc being killed. This is a queer world Neeraj. Great piece yet again, Neeraj. Keep it up.